The people of Christ Lutheran want to make God's love felt in our world. We value serving in our community, sharing resources in the world both in times of crisis, and to develop relationships with those who struggle to survive. We love to laugh with one another, welcome visitors, make our facilities available for groups that support our society, and develop strong friendships and support networks, because we really want to be there for others in their times of need. We are a medium sized congregation, large enough to provide a variety of programs and yet small enough to develop strong friendships. Our building is large enough to host big events, and those days when we don't physically fill all the seats in our worship space, it is full of spirit. We are part of the ELCA (Evangelical Lutheran Church in America). Lutherans are Christians who established the "Protestant" movement, lifting up a belief that God is loving, forgiving, and does not save us because of the life we've lived, but because we are beloved. This love is intended to change us out of gratitude, to love others in the manner Christ first loved us. I can meet God on a beautiful lakefront. I can meet God in personal Bible study and prayer. But I can’t meet you there. I understand how it is significant that we do church together. Participating in ritual alongside other people connects us with God in an important and unique way. Whether it’s trudging the road to the cross during Lent, or celebrating the risen Christ in the Eucharist, or living our day-to-day chaotic lives, church invites us to do it in community. Others’ simple presence tells us we’re not alone; we’re not the only ones. And that makes all the difference. 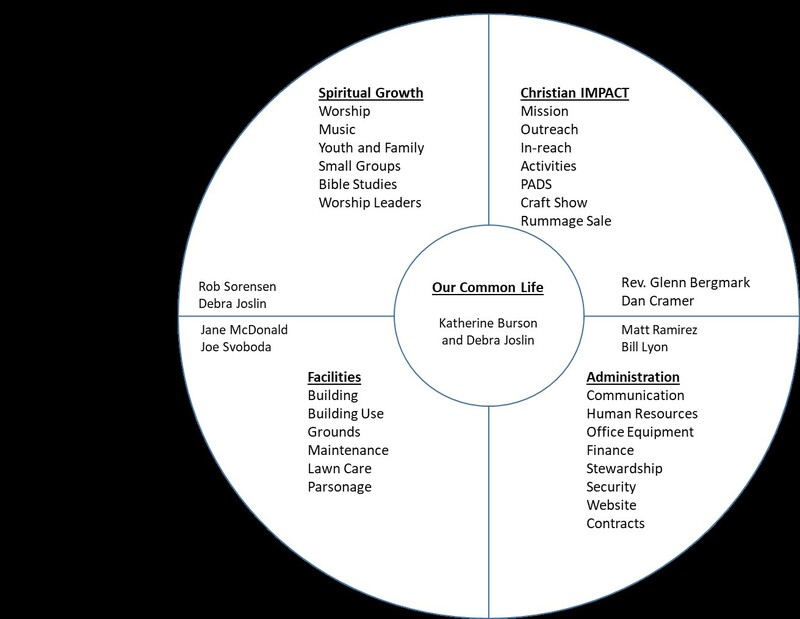 The Council Structure divides the ministry of Christ Lutheran Church into five "quadrants". This document will be updated when additional positions are determined. Bonnie Bucholz is currently serving as Interim Director of Traditional Music, creating beautiful music and song through the choir and bell choir. Her talents enhance our worship experience. ​Sing to the Lord a new song! As contemporary worship leader at Christ Lutheran Church I take this verse very literally. Even though I am a classically trained musician my roots are in the popular music I grew up with. This has made working with contemporary Christian music really fulfilling for me. God’s word set to modern beat, melody and harmony speaks to me in a way that is familiar, comforting and inspiring. ​As a co-coordinator of youth and family ministry I look forward to making God’s word and the life of Jesus come alive for the kids we teach. I hope to bring many new ideas for the children of Christ Lutheran Church to grow as disciples of Christ. I have years of experience working with children of all ages. I bring a long education history of religion to my position as I have a B.A. in Sociology with a minor in Religious Studies. 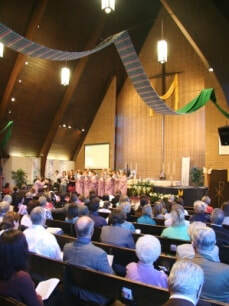 I look forward to growing the Youth and Family Ministry at Christ Lutheran Church. ​My passion is children, and providing children with experiences to learn. I am a big believer in active learning as opposed to sitting and learning. I taught at church preschools for about 14 years and have gained my teaching philosophy through many Christian education experiences. My hope by serving in CLC’s youth and family ministry is to increase the children’s knowledge of God and His grace and also to encourage an active faith in showing God’s love to others. ​We as a congregation need to find ways to connect with people in our modern, always buzzing world. A new way to connect is really an old concept, dating from the time of the Apostles, to meet where the people are and proclaim the Gospel to the community as it is shown in its modern context. It really is about taking the time to build personal relationships, something that we at Christ are very comfortable with, around each other. We need to take that comfort out to the streets. This can take many forms, from a group of people meeting on the train on the way to or from work, to a group of disenfranchised musicians searching for a way to continue their music ministry, or a new small group of those studying scripture in a library room for the first time. ​Richard currently resides in Lombard, though he is originally from Wheaton where he received some of his formal training at the Community School of the Arts at Wheaton College. He has served as music director and organist in many parishes in Texas, Florida and Illinois. Richard has played in the Chicago Youth Assemble and has been a soloist baritone with the Ave Maria Motet Choir in Ave Maria, Florida. ​I absolutely love being the "face" of Christ Lutheran Church in the office for visitors and guests who walk through our doors, whether on a Sunday morning, or a Wednesday afternoon. I hope that my attitude will always convey my heart for hospitality. I also take my role as Pastoral Assistant very seriously, and I strive to help Pastor manage ministry so that she can be the best Pastor she can be in every situation. That is what energizes me on a daily basis. I love my work and I hope it shows in everything I do. ​A photographic directory of members resides on Lifetouch. Each church member was given a login and password to view other's profiles and to maintain their own profile. Instructions on how to access the Lifetouch site and how to edit one's details can be found here.